WARNING: Bee Docs Discover has been discontinued and is no longer available. Bee Docs has developed the easiest to use and most powerful on-line document management system available. 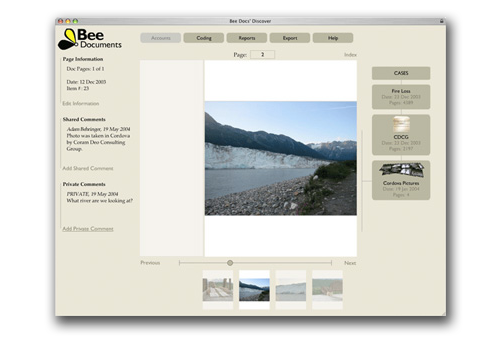 Bee Docs Discover allows you to access your case documentation from any web browser, and makes previously complex tasks simple for your entire team. In addition to the on-line tools, Bee Docs provides an integrated package of optional services including scanning, coding, and printing. Bee Docs Discover is a monthly subscription service which is priced based on page volume. This means that you will not have the high overhead and risk associated with setting up a custom system. Bee Docs thinks that all professional service firms, large and small, can benefit from a digital document management system. Whether you have been imaging your documents for years, or whether you are still searching through paper documents by hand, you will experience immediate benefits when switching to this intuitive product. Documents are worthless if you can not find them and costs can quickly spiral out of control when documents are un-organized. The backbone of Bee Docs Discover is a powerful database that stores imaged versions of your documents along with data associated with each document. Using the Discover web interface, you can search, sort, and filter groups of your documents based on criteria that you set. For example, you could easily find all the documents created between two specified dates. Sharing documents within your company and with clients, partners, and vendors is a very important, yet often overlooked, aspect of document management. With Bee Docs Discover you can easily e-mail, download, print, or order physical copies of some or all of your documents. In addition, you can also create accounts for people with a limited set of permissions appropriate to their needs. In this way, you will be able to share and collaborate with people, no matter where they are in the world. Archiving documents can be an expensive hassle. When you use Bee Docs Discover, you may easily order a CD-ROM or DVD which contains your document repository in a form that is great for storage and can be accessed without any special or proprietary software. Because you have a fine degree of control over the permissions that each person has to your documents, you can rest assured that clients or customers have access to what they need, but nothing more. This degree of control is impossible with physical documents. Additionally, for those working with medical documents, Bee Docs can guarantee in writing that all of our services, including Bee Docs Discover are compliant with HIPAA regulations.